How the social media is is used nowadays? The answer to this interesting question is available at 6S Marketing, one of North America's largest internet marketing firms, that has conducted a survey to investigate trends in social media usage. According to the survey results an overwhelming percentage of companies & individuals who have adopted social media for business and personal use and highlight the most popular forums and mediums for communication. "Collecting statistics on social media trends is important in ensuring that efforts made on behalf of our clients in the social media space are targeted and amplified," says Chris Breikss, Co-founder and President of 6S Marketing. "Beyond that, it was simply fascinating to gather the most up-to-date information on how and why companies & individuals alike are drawn to social media." 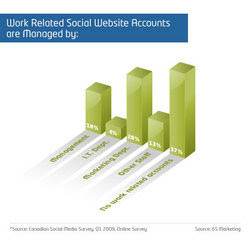 70% of respondents say they use social media. Facebook is the most popular social networking site with 70% of people surveyed currently having an account. 47% of respondents use Twitter and the majority of users are 19 - 25 years of age. Only 20% of people surveyed currently use MySpace. YouTube & Flickr are the most popular social media sites with 38% & 29% (respectively) of people surveyed using the sites. 42% of respondents do not blog, while 58% do blog. 74% of people who blog, do so for personal purposes, 57% blog for work and 35% blog for both. 9% of people surveyed have hired an employee online and 22% have received a job offer online. 69% have done neither. "The face of communications has shifted dramatically. It is our belief that social media provides businesses and people the ability to connect with communities and networks as they increasingly live and work online. Our survey results indicate enormous potential for our clients to participate in the social media realm," comments Breikss.